Gibson runs East/West and is North of Bullhead Park. San Pedro runs right into Field 2 which runs North/ South. Field 8 is to the east or on the left. 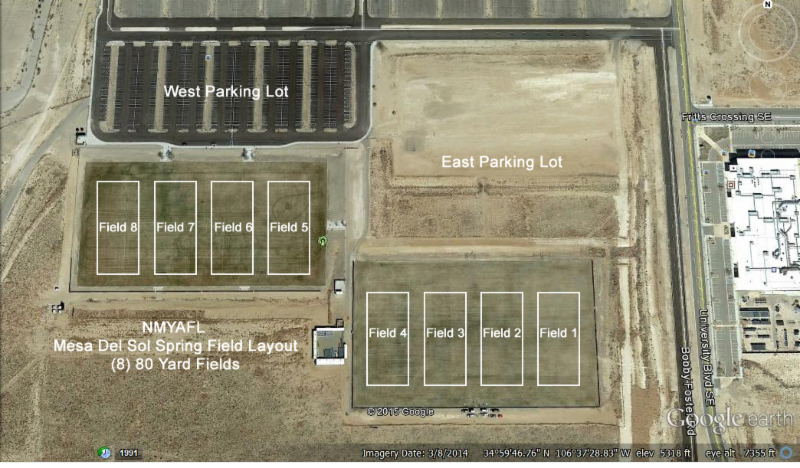 There will be approximately 30 Parking spaces reserved for Officials at Bullhead, directly North of Field two. Please advise you parents and fans about this to avoid any confrontations or conflicts. Thanks. 5601 University Blvd SE Albuquerque NM 87102 - Mesa Del Sol Field direction from I40 and I25: Go South on I25 from the big I and get off at the Rio Bravo Exit. Make a left at the stop light and go under the freeway. Make a right onto University. Take University to the Journal Pavilion. Make a right into the parking lot of the Pavilion and then look left. The fields are just south of the Pavilion but they share the parking lot. 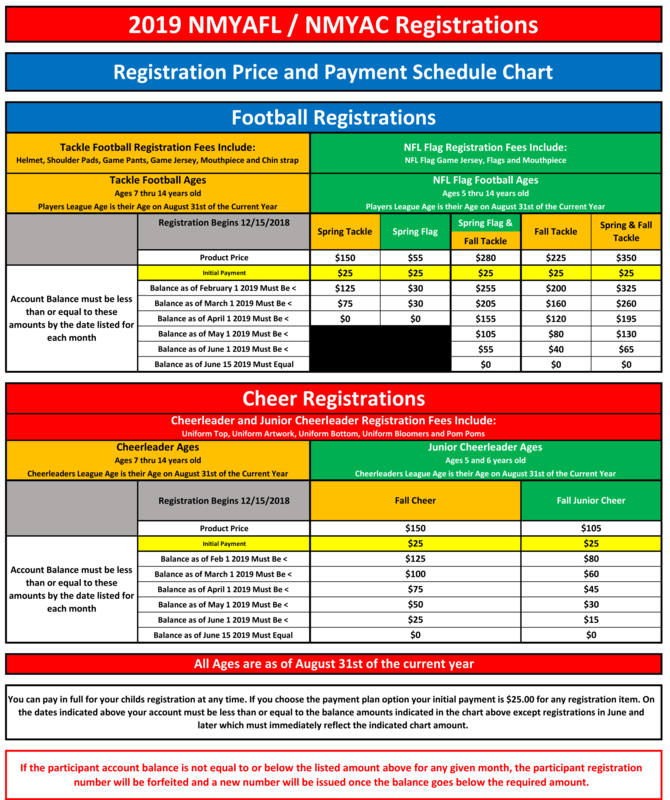 Games in Los Lunas are at Heritage Park located at the Y just across the street from the Smith's in LOS LUNAS. Highland High School is located at 4700 Coal Avenue SE-Major cross streets are Off Zuni-just South of San Mateo. Highland turf field is east of the high school and Highland Retention Field in directly across the street from the front door of the high school. 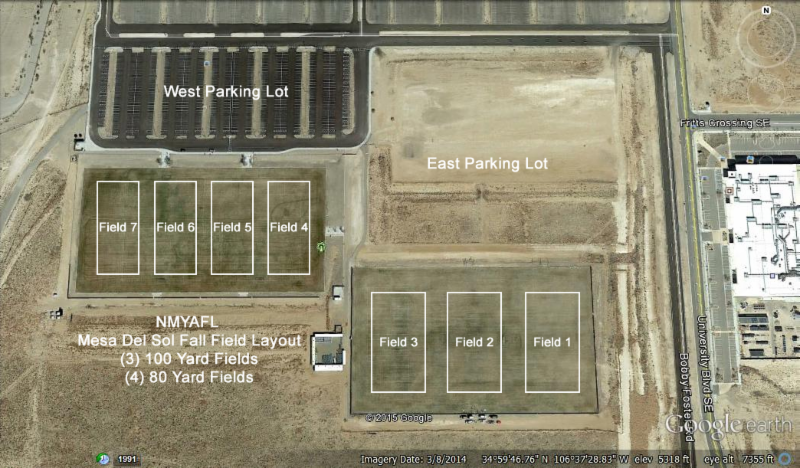 Rio Rancho fields are in Rio Rancho at High Resort Sports Complex. High Resort is located on High Resort Blvd north of Hwy 528, Turn West off 528, go approximately one mile on North side of Street. Bernalillo High School fields are located to the East of the school, which is just North of HWY 44, and East of North Camino Del Pueblo, El Camino Real. 10549 Universe Blvd NW Albuquerque NM 87114 - CNM Westside Campus Fields are north of Paseo Del Norte off of Universe. Go west on paseo del norte and north on universe and the CNM Campus is on the left approximately 2 miles. At Highland High School there are NO SUNFLOWER SEEDS whatsover! NO Alcohol, or DRUGS and NO VENDING, or Tailgating.